Every Monday evening you will receive a newsletter with our trade idea. Start selling one Iron Condor per week. Do not invest all money at the same time. Use only one trade. Every week you will be opening a new trade and at seventh week you will be opening a trade #7 while on Friday, your trade #1 will be expiring. From then you will have expiration every week. You trading will now simulate weekly trading. You will have weekly income money making machine on and running. As I said, I do not have my own experience on this, but I have seen many experience traders advocating and opening new trades on Tuesdays or Wednesdays and sometimes on Thursdays. Yes, it is cheaper to trader wider spread than narrow one with more contracts. Try it for yourself. If you open for example a 15 dollar wide spread and three 5 dollar spreads, you will pay commissions for 15 dollar spread for one contract. It could be let’s say $11.00. Thank you for all the work and guidelines you post here for free. I had a look at the champions list and found it still needs a lot of screening as many stocks just don’t have enough option activity to be worth considering for put selling. The champions list is mostly for purchasing the dividend stocks, so yes you need to screen them for being optionable. It is however difficult to find good optionable stocks. Those worth selling options on are in my Watch List. Really cool website this.. have been reading a lot. I notice in your strategy rules above that there is only one that mentions any technical analysis. You mention looking for getting in around supports etc. What tools would you use for that? Just drawing lines or do you use any indicators at all? Hi, I use Fibonacci levels and then draw supports and resistances based on the market behavior. Thanks Martin, keep up the great info! This is fantastic. Thank you!! Thank you. Found your blog and it has been immensely informative. What are your thoughts on selling puts on a 3x fund such as TNA? I guess it would by like trading any index. I would have to watch it for some time to see how its options react to the market moves. The only thing I do not like is that it is not marginable so trading June contract 60 strike you make 53 premiums and you will need 5,346 margin to trade it. Too much money for not much music. I’ve just found your website and read several posts. You’ve done a wonderful job of sharing and imparting your knowledge in a clear and concise read. Kudos for your commitment to assisting others in their efforts to trade options profitably. 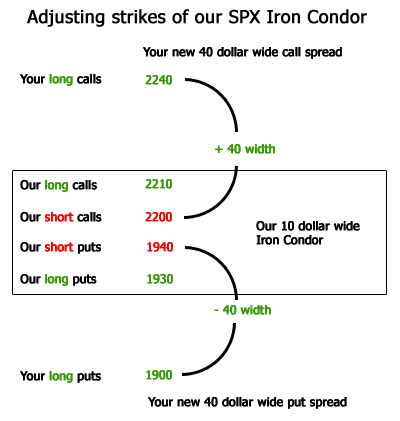 One question I had though in your SPX trading strategy relates to the 40 dollar wide strikes you use. Your discussion of the logic in using the wider strikes seems to neglect one important metric in designing trades and that is margin impact. If I choose to trade a Nov1 15 iron condor in SPX with short strikes of 1700/2200, using your 40 dollar wide strikes I get a trade that looks like this – 1660/1700/2220/2260. Using TOS, I right click on the trade, hit “confirm and send” and a dialogue box pops up which shows me I will get a $202.01 credit after commissions with a resulting buying power effect of ($3,797.99) which equates to a 5.31% return on risk. If I then use the same short strikes but make the strikes 5 dollars wide, I get a trade that looks like this – 1695/1700/2220/2225. Now I adjust the number of contracts so it comes as close to the buying power effect above of ($3,797.99) and I get 8 contracts. Again, opening the dialogue box which summarizes the trade, it shows a credit of $246.01 after commissions with a resulting buying power effect of ($3,753.99) which equates to a 6.55% return on risk. Isn’t that getting me more bang for my buck? Please consider the above scenario and see if I’ve missed something. Hi Steve, thank you for you kind words. To you question, it is a matter of priorities. Yes with 8 contracts you get about $44 more or 1% more, but your risk losing entire credit is a lot higher than mine. 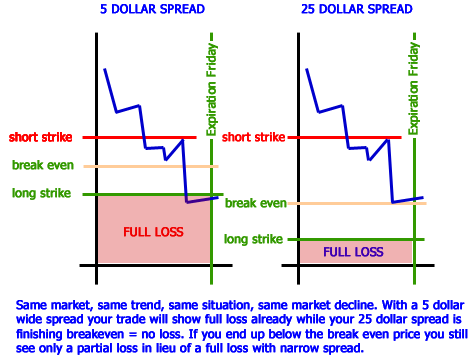 As I tried to describe in the post, 5 dollar spread has a higher likeliness of the price smashing thru both strikes than 40 dollars spread. It is the same with 50% credit capturing strategy. When I receive $180 credit, why liquidating it at $90 and not keeping the entire credit and letting the trade expire worthless? Well, the numbers are against you and you will be better off with a wider spread and closing it at 50% credit although it looks better otherwise at first look. And actually it is not. Trading 5 dollars spread is OK if you do not have that margin available (I do not have it, so I only trade 10 dollars spread and working towards 40 dollar spread goal). So the entire spread width meaning lays in probability of success and not the immediate gain. I personally would prefer lesser gain but lower risk and higher probability of success than 1% more gain and a chance that if the trade goes against me I have higher chance of losing the entire risked spread.